Disclosure: This post is sponsored by PetSmart® and the BlogPaws™ Pet Influencer Network™. PetSmart is not responsible for the content of this article. 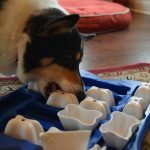 It is no secret that my corgis are always hungry! They would happily eat ten times per day if they could. So, they also enthusiastically support the new Buy a Bag, Give a Meal™ program at PetSmart®. The program provides a super simple way to give to pets in need. 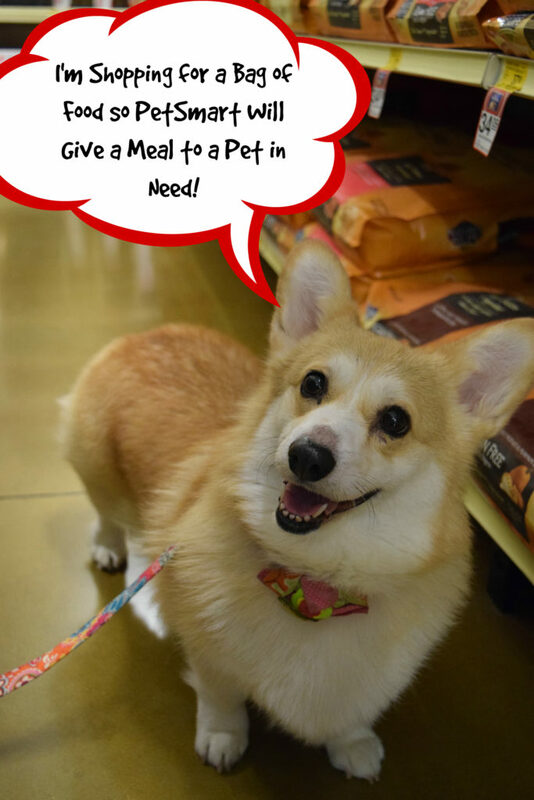 Simply buy a bag of pet food at PetSmart and the PetSmart in turn will donate a meal to a pet in need. PetSmart estimates that it will donate more than 60 million pet food meals through the program in 2017! 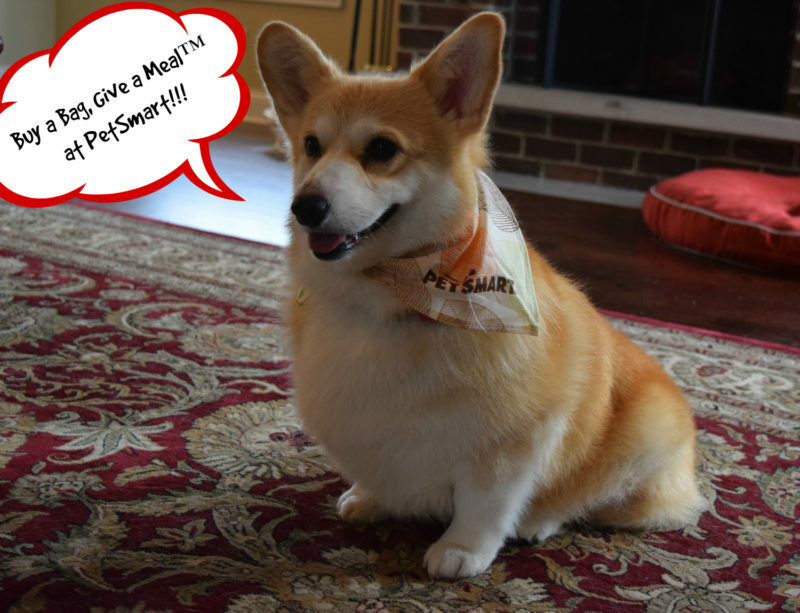 PetSmart launched the Buy a Bag, Give a Meal™ In celebration of its 30th anniversary. Under the program, between March 1 and December 31, 2017, PetSmart will donate a meal to a pet in need served by pet shelters, animal welfare organizations and food banks for every bag of dog or cat food purchased, whether online or at one of PetSmart’s retail stores. The program will run from March 1 to December 31, 2017. David Haworth, DVM, Ph.D., and president of PetSmart Charities, reports that up to 7 million pets enter shelters every year. While awaiting adoption, they need access to pet food, which is a significant operating expense for animal welfare organizations. 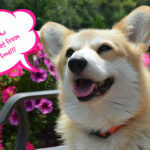 According to a recent PetSmart Charities survey of its animal welfare partners, only 20 percent of the organizations receive pet food donations and about 8 percent are on contract with pet food brands to receive subsidized pet food. Further, not all pets in need live at shelters. Many are with families served by food banks and pantries. 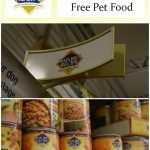 Pet food is rarely offered at human food bank programs and it is not an eligible purchase item in most food assistance programs. This causes some families in need to sacrifice their own food by feeding their pets human food to ensure that they are fed. No one should go hungry, whether it be a human or an animal! See more about the program in the video below! One of Eve’s favorite activities is visiting PetSmart. She is super social and she loves to shop! 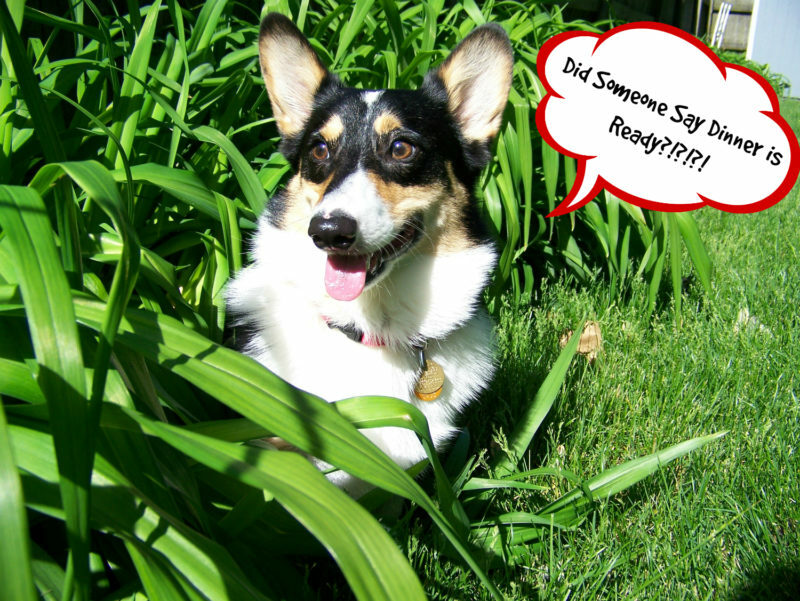 Needless to say, with the new Buy a Bag, Give a Meal™ program, we will have more reasons than ever to visit PetSmart! 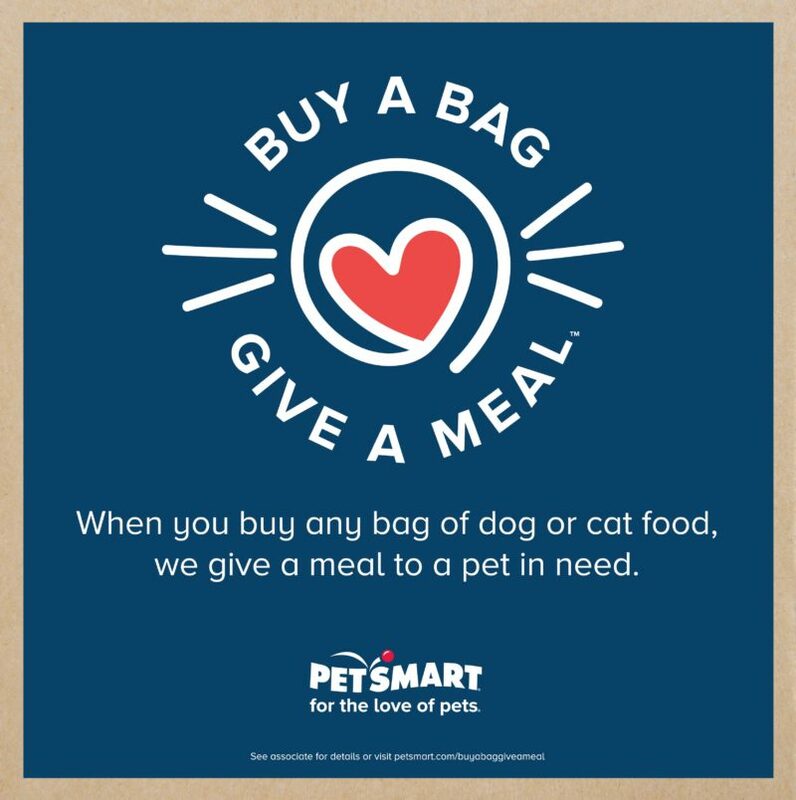 Through the Buy a Bag, Give a Meal™ program PetSmart will help eliminate some of the struggles faced by animal welfare organization and food banks when it comes to providing care for pets. Our family thinks that is a great idea! For 30 years PetSmart Charities has been a leader in adoption, saving more than 7.3 million pets’ lives. PetSmart Charities is also the leading funder of animal welfare across North America, donating about $300 million to date to help pets in need. We are thankful for all that they do to help needy pets. 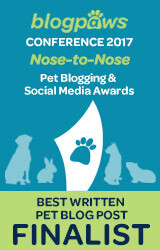 Read the PetSmart press release here. I had no idea. What a cool program. Thanks for sharing! That is awesome, I love it when companies help out rescues. Does it apply to online orders as well? What a magnificent program! I love how it runs all the way through the end of the year, that is incredibly generous. I volunteered at a Phoenix county shelter for several years and PetSmart was so generous to us! I’ll never forget how much they helped the animals in our care. Kudos to PetSmart and PetSmart Charities for giving back to pets in need across the country! Adorable video, I love it!! Yay! Kudos to PetSmart for giving back to rescues! Such a great program. 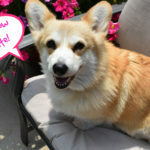 And your Corgi is adorable! This is just the best program! 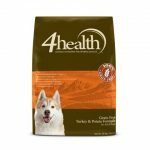 Helping pets in need couldn’t be any easier than buying a bag of your pets food! Such an easy way to give back without having to spend extra money! I love the campaign but I already commented on the same thing about 15 times; really don’t know what else to come up with 😉 Love the campaign, though. I like that this campaign applies to both online and in-store purchases. I also appreciate that it applies to Canada and Puerto Rico, not just the United States. Great way to celebrate an anniversary! I was on that tour too. Their headquarters were awesome! Such a great program! Love that it makes it so easy to help pets in need just by doing something that many of us do anyway – shopping at PetSmart. Such a great campaign! As a former pet in need, I approve! 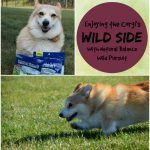 I’ve read a lot about this program at PetSmart and think it’s a wonderful program. I purchased a bag of cat food last week and hope it went towards this project. Just another reason to love PetSmart. 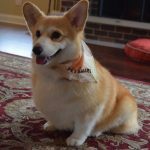 Your corgis are so cute! 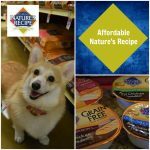 All pet parents have to buy food, so this is an excellent campaign! I love it. So happy PetSmart is giving back to pets in need. 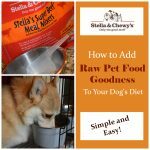 As a rescue and an always hungry Pug, Kilo also enthusiastically endorses this program. 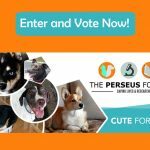 Such an easy way to help pets and humans in need without extra cost. Love this program – and we couldn’t be more proud to participate in it as well! Thanks for helping to get the word out! What a wonderful program! What cute pups! Thanks for sharing.